Gather ye rosebuds while ye may, / Old Time is still a-flying; / And this same flower that smiles today / To-morrow will be dying. Last week Shakespeare, this week Herrick. Apologies for the Renaissance glut, but it’s seasonal. Quite possibly the fault of a misspent youth, when laziness throughout the rest of the year meant I was forced to spend May in the company of Shakespeare, Donne, Sidney, Middleton, Jonson, Kyd and the rest of the gang, trying to make up for lost time as exams loomed. So for me, all those short-lived springtime delights, such as apricots, cherries, medlars and mulberries, have always been associated with Marlowe and friends. Interestingly, though, spring food and Ren. Lit. are bound together by much more than my laziness-induced study habits. Because the point Herrick would perhaps have got round to making – had he not been distracted by guaranteed mood-killers such as the transience of youth and the inevitability of death – is that although this is the time of year that mulberries start to arrive on market stalls, it is also the time of year they start disappearing. Like rosebuds, no sooner are they here than they seem to be gone. Message: carpe diem – grasp your opportunities (and mulberries) while you can. So, without wasting any more time, let’s get back to the issue at hand. You’re likely to find mulberries proudly displayed in tiny plastic cartons, if you find them at all. This is partly to protect them, and partly because you won’t be buying these delicate gems by the kilo – they don’t keep and they aren’t cheap. 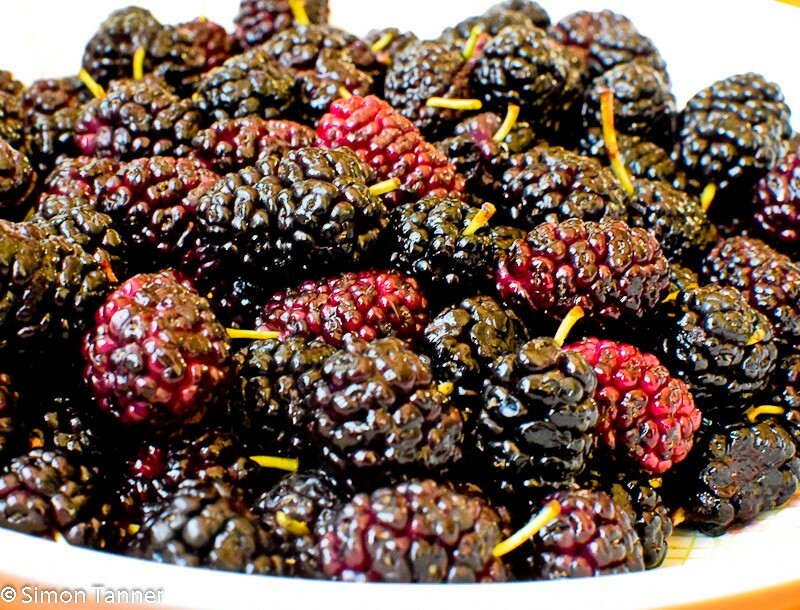 These are the beluga of the fruit world (aptly, a black mulberry looks somewhat similar to a dollop of caviar). That’s one of the reasons why turning them into granita is such a good option – you get the glorious colour and taste of the fruit and manage to stretch out a fairly meagre amount into a spring breakfast for four. 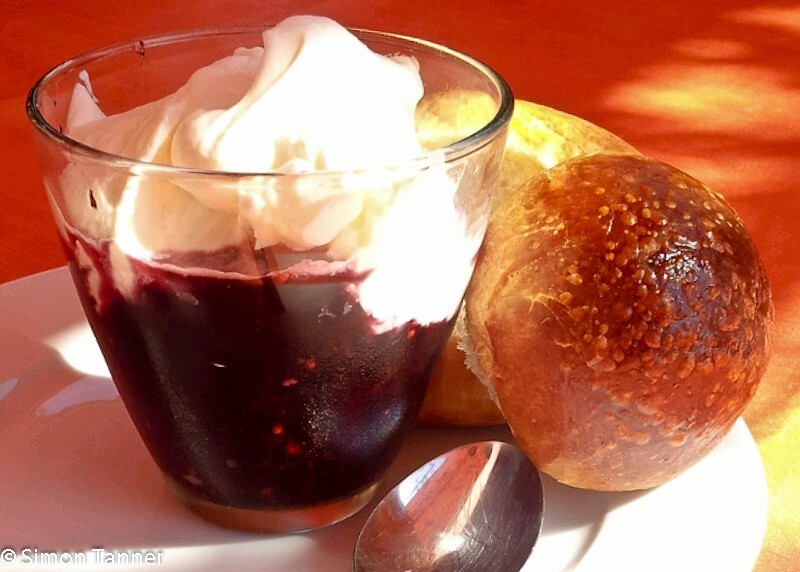 Yes, this is breakfast fare in Sicily, and although granita may be eaten at any time during the hot summer days, the majority is knocked back as a warm-weather substitute for the more winter-friendly cappuccino and cornetto. I give instructions for making it both in an ice-cream maker and in the freezer. It will be better, quicker and easier in an ice-cream maker, but it would be a shame if not having one stopped you from trying your hand at this classic Sicilian sweet. Especially since many Sicilians manage to get by without. Herrick would have approved. Actually, I think Herrick could have done with some. Use a food processor or hand blender to blitz together the mulberries and lemon juice. Make a syrup by heating the water and sugar until the latter dissolves. Leave the syrup to cool and stir in the mulberry and lemon purée. Pour into ice-cream maker. You want to obtain a smooth consistency (it should take about 20-25 minutes). If you don’t have an ice-cream maker, pour mixture into a deep round cake tin or similar which you have already chilled in the freezer. After about 30 minutes, stir well to break up and redistribute any ice crystals that have formed (particularly around the edges). Repeat this every 30 minutes until the granita is ready (about 3 hours). Having said that, let’s go back to point 4: invest in an ice-cream maker. It can also, and of course above all, be used to make home-made ice-cream. Any ice-cream where you get to decide how much fresh fruit, cream or top quality chocolate go into it is guaranteed to be divine. When I bought mine, even I suspected an attack of acute gadgetitis. But it turned out to be one of the kitchen appliances I use the most (although, admittedly, only in the summer). Spoon into glasses, and top with obscene amounts of whipped cream. Serve with brioches or warm, freshly baked white rolls. This entry was posted in Ingredients, Sweets and tagged gelsi, granita, granita di gelsi, mulberries by hungryenglishman. Bookmark the permalink.